That area in the bottom right corner of your Windows screen is just loaded with valuable information. But in a lot of cases you don’t see everything that’s going on down there because some of the icons are hidden. Here’s how to get all those icons to be visible all the time. The image shown above is the Notification Area on my main computer. I don’t always have all of those icons there, but what I like is that whatever is running there at any given time is visible at a glance. 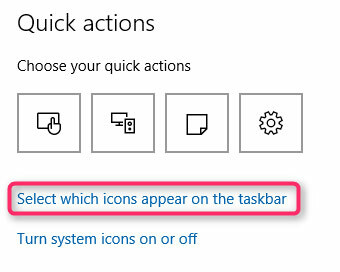 Microsoft does not have it set that way by default. If you don’t make any changes, you’ll be able to see some of the icons down in that area, but not all of them. There will be a little triangle icon at the left end of that row, and when you click that you’ll have the option to see all of the icons that aren’t displayed naturally. But that’s a pain! What if you just want all of them to show, all of the time, without having to making any extra clicks to view the hidden ones? 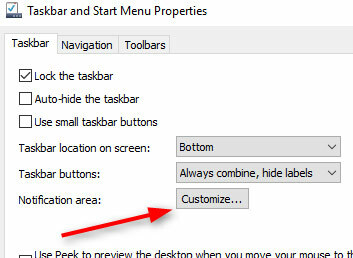 Click the little triangle, then in the new small window click on “Customize”. That’s it! Now, you will always see what icons are there without having to click on anything else to see the “hidden” icons, since none of them will be hidden.